So, remember when I made the Honey Dijon Chicken Breasts? That was the night I was dog-tired and just wanted something easy to cook that required minimum effort and thought. And I said I wished I just had some Shake ‘n Bake? Well, I've had a few more nights like that since and I got to thinking… why don’t you just figure out how to make your own crispy coating and keep some around? I should also mention that I can't hear the words "shake and bake" without thinking about Talladega Nights. And I have a huge fluffy black cat named Ricky Bobby. And here's a Talladega Nights Shake n' Bake montage. Because it's good to laugh. The thing about Shake ‘n Bake is that it’s crunchy. I can coat stuff in bread crumbs or parmesan cheese and even use egg wash but it’s never really good and crunchy. So I got to thinking about that crunch. There’s only one thing that creates a crunch like that: fat. So I figured that’s what’s in Shake ‘n Bake that makes it so crunchy. The last time I was at the grocery store I took a look at the box to see the fat content and ingredients and sure enough, it’s got some fat by way of hydrogenated oils. 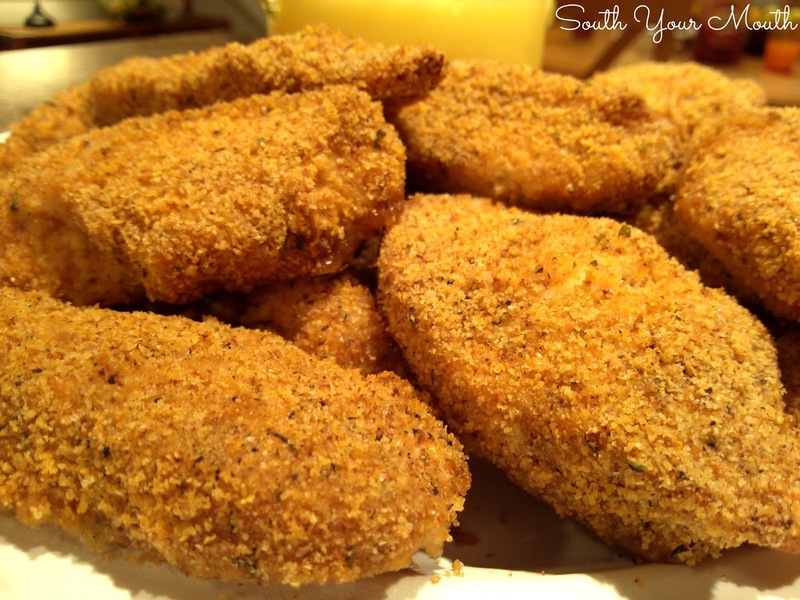 This weekend I decided to try to make my own crispy breadcrumb coating and I totally did! I went ahead and made a big batch so I could have more for later. I portioned it out into quart-sized zip-top bags and popped them in the freezer so they’ll be ready to go the next time I want something quick and easy! Angel Baby was in the kitchen with me while I was tinkering (as she usually is) and I got to thinking about those old commercials with the little girl who’d say, “It’s shake and bake and I helped!” I told AB about the commercials and asked her to say the line. And by God, she was a dead-ringer for that little girl in the commercials! I grabbed my phone and shot a quick video of her. Ain't she cute!? 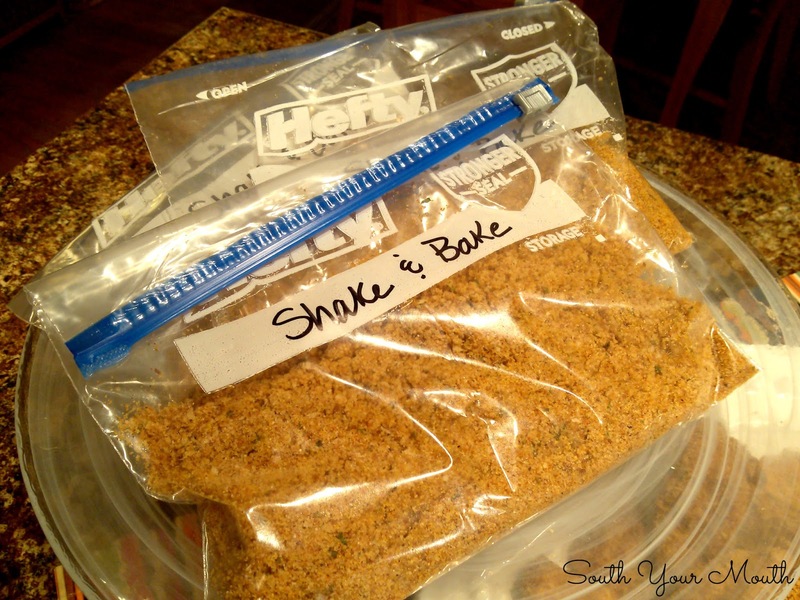 Combine bread crumbs and seasonings and mix well. Slowly whisk in vegetable oil and continue whisking until all ingredients are thoroughly combined. Divide mixture evenly into 4 quart-sized or gallon-sized zip-top bags. Store in freezer for up to one year. Bring to room temperature before using. Place uncooked chicken or pork, one piece at a time (unless preparing chicken nuggets or strips – in which case add 3-4 pieces at a time), in zip-top bag of Shake & Bake. Seal bag and shake until meat is thoroughly coated. Whole, bone-in chicken pieces – 375 degrees for 35-45 minutes or until chicken is cooked through and coating is crunchy. Whole, boneless chicken breasts – 400 degrees for 25-30 minutes or until chicken is cooked through and coating is crunchy. 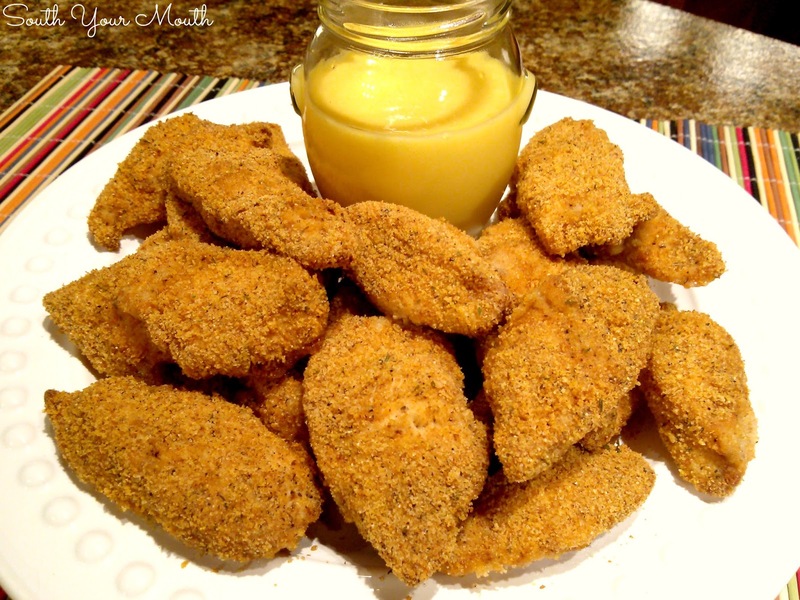 Chicken strips or nuggets – 400 degrees for 20-25 minutes or until chicken is cooked through and coating is crunchy. Bone-in pork chops – 375 degrees for 35-45 minutes or until pork is cooked through and coating is crunchy. Boneless pork chops – 400 degrees for 25-30 minutes or until pork is cooked through and coating is crunchy. Great recipe for the Shake 'N Bake. On the honey mustard dressing, this is almost the recipe my mentor gave me but she adds salt and pepper to taste and poppyseeds thereby making it Honey Mustard Poppy Seed dressing. It is fantastic to mix with a bag of pre-cut cabbage (the kind with carrots in it), craisins and add chow mein noodles for crunch! Makes for a quick salad to go with just about anything...I usually serve it with ribs or fish. Thanks for the recipe! This kind of mix is great for pork tenderloins too. Roll in coating and bake at 425 degrees for about 25 minutes. Yum! Thanks for the recipe, can't wait to get some made up. Love to keep these kind of items in my freezer. Thanks, too, for providing a quick click to Ziplist..such a fast, convenient way to save all those wonderful recipes! Loved this recipe! It worked perfectly with the Ian's gluten free panko crumbs! Thank you. Made this today in my food processor. It was so EASY! Love your website! This tasted great and is easy to make! Thank you so much. I'm happy I found your website. Can't wait to try some of your other recipes. Not sure why the oil?? (recipe clumps together horribly) remade it without the oil and it tasted great! Just made this, it was AWESOME! Do not change the recipe, it was perfect and tasted just like the boxed stuff with the warm and fuzzies of knowing you made it yourself. I found this recipe over a year ago, and it has become a regular part of my cooking repertoire. This recipe is the BEST! I like it better than the store bought version. The oil gives it just the perfect crispiness. I separate into large ziplocks, throw into the freezer and they are ready to go when I am. I pull the bag out at the same time I pull out the chicken to thaw. Makes a very quick meal. I made the Shake and Bake to use one bag with boneless pork loin chops. I happen to have some Smoked Paprika that I thought would be good. I made each bag leaving the Paprika last. I put a half tsp of the regular Paprika in two bags and the smoked in two bags then mixed each bag shaking them. The Smoked Paprika on the chops was good. I may use a little extra next time. My only problem was getting the mix to stick to the chops. May try egg wash next time. It's perfect! Thank you so much. ps I did this in the food processor and it worked really well. Thanks again.